Stoelting mdl. RTW-236 3-Stage Parts Washer s/n 0401-1020 w/ Temperature Controllers, Timers, Pumps and Exhaust. Carolina HD10 10” Horizontal Band Saw s/n 32878 w/ Manual Clamping, Coolant. Rockwell mdl. 28-30C 14” Vertical Band Saw. Kalamazoo K10 10” Abrasive Cutoff Saw. Burgmaster 6-Station Automatic Turret Drill w/ Burgmaster Cycle and Feed Controls, 12” x 17” Table. Burgmaster 6-Station Turret Drill s/n 5616 w/ 31” x 40” Table. Burgmaster 6-Station Turret Drill s/n 5426 w/ 12” x 17” Table. Burgmaster Bench Model 6-Station Turret Drill w/ 8” x 12” Table. Peerless 9-Speed Pedestal Drill Press. Pro-Tech 5-Speed Bench Model Drill Press. 2010 Speedaire 10Hp Horizontal Air Compressor w/ 2-Stage Pump, 120 Gallon Tank. Hankison mdl. HIT35 Refrigerated Air Dryer. 12 Ton Hydraulic H-Frame Press. Davenport 5th Position Tooling Arms, 4th Position Slotting Attachments, Recess Tooling Holders. Davenport and Brown & Sharpe Collets, Feed Pads, Cams and Gear Sets. Geometric Die Heads, Knurling Tools, Burnishing Tools, Box and Floating Tools. Kurt 6” Angle-Lock Vise w/ Swivel Base. 3” and 4” Pneumatic Vises. 5C Indexing and Rotary Heads. 6” x 12” Cross Slide Tables. Drills, Tape, Reamers, Center Drills, Endmills, Thread Chasers, Turning Inserts, Mill Slot Cutters, Lathe Tooling. Fowler Table Model 12” Optical Comparator w/ Digital Indicators. MicroVu mdl. 500HP 12” Optical Comparator w/ Digital Indicators. Scherr Tumico Floor Model 14” Optical Comparator. (2) Mitutoyo 12” Height Masters. Mitutoyo Suftest-212 Surface Roughness Tester. Sunnen CF-1126 and CF-502 Setting Fixtures. Chaun 0-12” OD Mic Set. Mitutoyo 6” Digital and Dial Calipers. SPI and Linear Dial Caliper Gages. Mitutoyo 0-1” Digital OD Mic , 0-1” Thread Pitch Mic, 0-1” Blade Mic. Granite Indicator Bases w/ Indicators. Yale GLC060TGNUAE84A 6000 Lb Cap LPG Forklift s/n E187V14651X w/ 3-Stage Mast, 187” Lift Height, Side Shift, Solid Tires, 8257 Metered Hours. Raw Materials Including Titanium, Brass, Aluminum, 303, 304, 416, 4340, 12L14, 1018 and 1215. Brown & Sharpe No. 2 1 5/8” Cap. CNC Screw Machine s/n 542-2-7610-1 5/8 w/ Retromatic Conversions Summit Bandit CNC Controls, 4-Speeds, 4-Cross Slides, 6-Station Turret, Bar Feed. Brown & Sharpe Ultramatic R/S No. 2G ¾” Cap. Automatic Screw Machine s/n 542-2-8491-3/4 w/4-Speeds, 4-Cross Slides, 6-Station Turret, Bar Feed. Brown & Sharpe No. 2 1 ½” Cap. Automatic Screw Machine s/n 542-2-601 w/ 3-Cross Slides, 6-Station Turret, Bar Feed. (2) Brown & Sharpe No. 2 1 ¼” Cap. Automatic Screw Machines s/n’s 542-2-8016-1 ¼, 542-2-6784-1 ¼ w/ 4-Speeds, 3-Cross Slides, 6-Station Turret, Bar Feed. Brown & Sharpe No. 2 1 ¼” Cap. Automatic Screw Machine s/n 542-2-3338-1 ¼ w/ 3-Cross Slides, 6-Station Turret, Bar Feed. (17) Davenport mdl. B 5-Spindle Automatic Screw Machines w/ Various Attachments Including Drill Stations, 4-Cross Slides, Spindle Stop Clutches Installed, 4th Position Motorized Slotting Attachment, 5th Position Knurling Attachment, 5th Position Thread Roll Attachment, 5th Position Cross Slide , Threading Attachment, Pickup Attachment, Back Countersink Attachment, Single Acting and Double Acting Chip Augers, Bar Feed. Brown & Sharpe No. 00G ½” Cap. Automatic Screw Machine s/n 21412 w/ 3-Cross Slides, 6-Station Turret, Lipe 68-AML Pneumatic Bar Loader/Feeder. (2) Brown & Sharpe No. 00G ½” Cap. 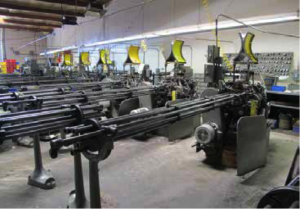 Automatic Screw Machines s/n’s 20504, 20008 w/ 3-Cross Slides, 6-Station Turret, Bar Feed. 542-00-1663 w/ 3-Cross Slides, 6-Station Turret, Bar Feed. Bridgeport Vertical Mill s/n 256245 w/ Sony DRO, 2Hp Motor, 60-4200 Dial Change RPM, Chrome Ways, Power Feed 9” x 48” Table. Bridgeport Vertical Mill w/ Futaba DRO, 60-4200 Dial Change RPM, Chrome Ways, Power Feed, 9” x 48” Table. Enco Vertical Mill w/ Enco DRO, 78-4800 RPM, 16-Speeds, Chrome Box Ways, Power Feed, 9” x 42” Table. Bridgeport Cylindrical Ram Style Vertical Mill s/n 21464 w/ 1Hp Motor, 80-2720 RPM, Power Feed, 9” x 36” Table. PC mdl. AM-VO-A1S Cylindrical Ram Style Vertical Mill s/n 169. Senior Horizontal Mill w/ Pneumatic Table Feeds, Arbor and Support. Diamond Pneumatic Horizontal Mill w/ 6” x 22” Pneumatic Feed Table, Arbor and Support. Hardinge DSM59 Second OP Lathe w/ 230-3500 RPM, Cross Slide, 6-Station Turret, No. 21 Collet Closer, Coolant. Hardinge DSM59 Second OP Lathe w/ 6-Station Turret, 5C Collet Closer, Coolant. Rutland Second OP Lathe w/ 230-3500 RPM, 6-Station Turret, 5C Collet Closer, Coolant. Lin Huan Second OP Lathe s/n 682586 w/ Cross Slide, 6-Station Turret, 5C Collet Closer. Jet 1236PY 12” x 36” Gap Bed Lathe s/n L83-10-416 w/ 60-1240 RPM, Inch Threading, Tailstock, 5C Collet Closer, 6” 3-Jaw Chuck. Boyar Schultz “Six Twelve” 6” x 12” Surface Grinder s/n 16063 w/ Magnetic Chuck.